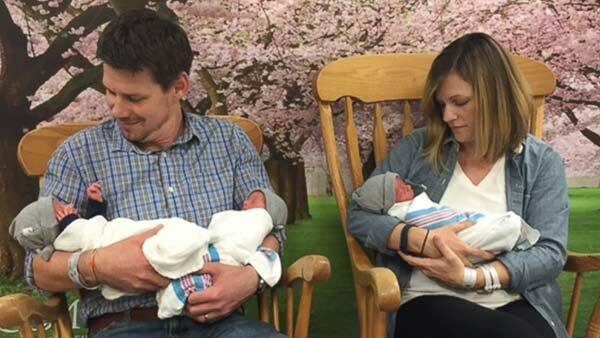 BALTIMORE -- One's company, two's a crowd, and three's a party -- Kristen and Tom Hewitt know that firsthand after giving birth to extremely rare identical triplets in Baltimore earlier this month, ABC News reports. Kristen Hewitt said that when the couple got their first ultrasound, the technician was abnormally quiet. To break up the silence, her husband jokingly asked "if there was more than one baby in there." The tech laughed and broke the news that the couple had not one, not two, but three buns in the oven. Because the incidence of identical triplets, where one fertilized egg splits three times, is so low, there are very few absolute statistics on them. Doctors said the odds of babies like Thomas III "Tripp," Finnegan "Finn," and Oliver "Ollie" being conceived without the use of fertility treatments could be as high as one in two million.